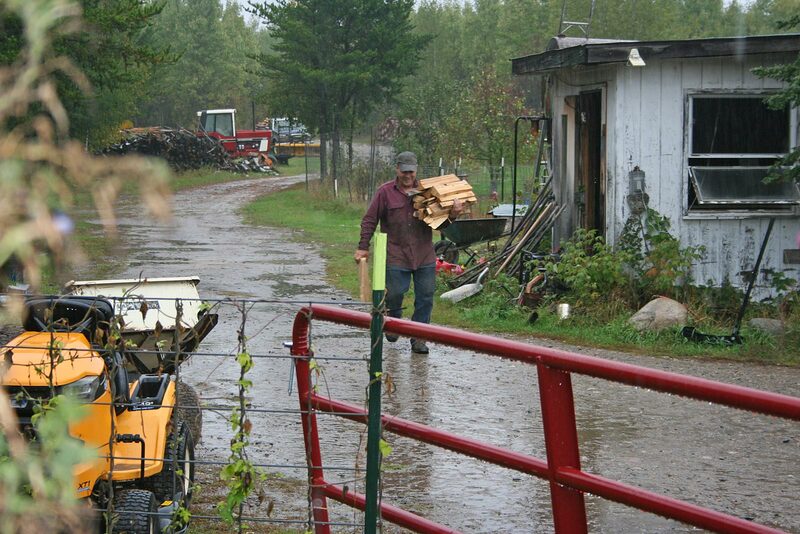 Will is running through the rain with firewood so we can stay toasty during this damp cold weather. We’ve been dashing around in between raindrops trying to get fall stuff accomplished. No fun when it’s in the forties and raining continually. (Will says “welcome to Washington” as it’s what he hated when he lived on the West Coast.) Our friends from the Watering Can came out and helped us harvest pumpkins and squash from the North garden. They ended up with a whole van full and we got wet feet. Luckily, it wasn’t raining when we were picking them but it sure had before. Did I mention the North garden is white clay based? Adding manure to it sure helped, but we’ve got a few more years before it gets less pottery-clay-like. 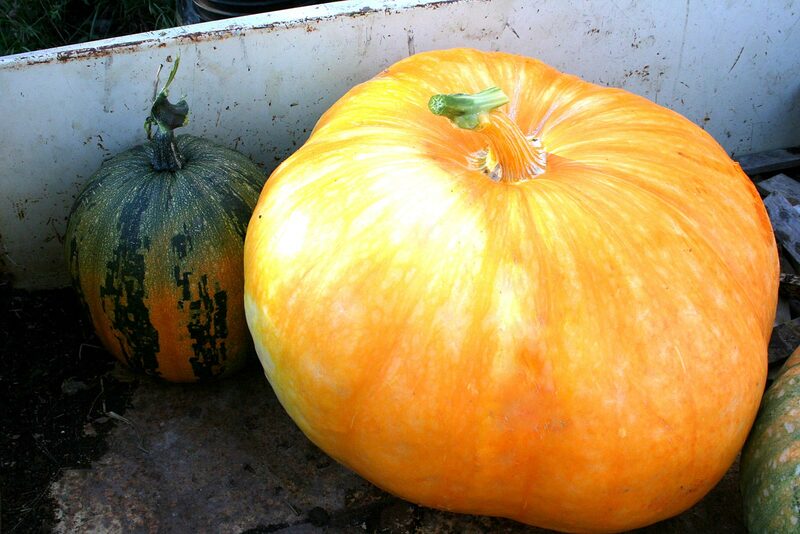 Here’s our biggest Atlantic Giant pumpkin from the North garden — 150 pounds! We also harvested all the pumpkins and squash from the Sand garden as it was supposed to frost, and frost can sure damage these crops. We especially love the Iran pumpkins, from which we’ll harvest plenty of seed. We grew a few last year and found them wonderfully productive as well as beautiful and tasty. They made a crop even after the cows got into the North garden and ate most everything. (This year we fortified the electric fence around the 6-foot welded wire fence and no cows.) Last night I used the tomatoes I’d harvested seed from to make chunky tomato sauce. It was a good use of the tomatoes and helped use up some of the great green sweet peppers we still have out in the hoop house. 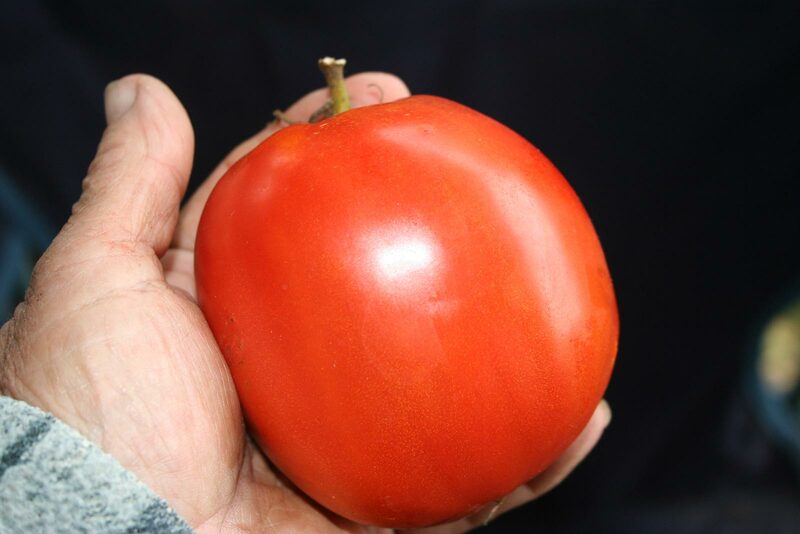 As they’re forecasting temps in the high twenties Friday night, we’re trying to wrap up the tomato seed harvest as well as any other sensitive crops left out. Will picked all of our melons and we’ve been busy harvesting seed from those which were pure. (Darn; we have to eat those melons!) Oh my, but they taste great and are so juicy! Who would have thought we could find muskmelons and watermelons which would ripen well in Northern Minnesota without pampering? With tomatoes like this Ruth Collier Large Paste tomato, I just had to make more tomato sauce! 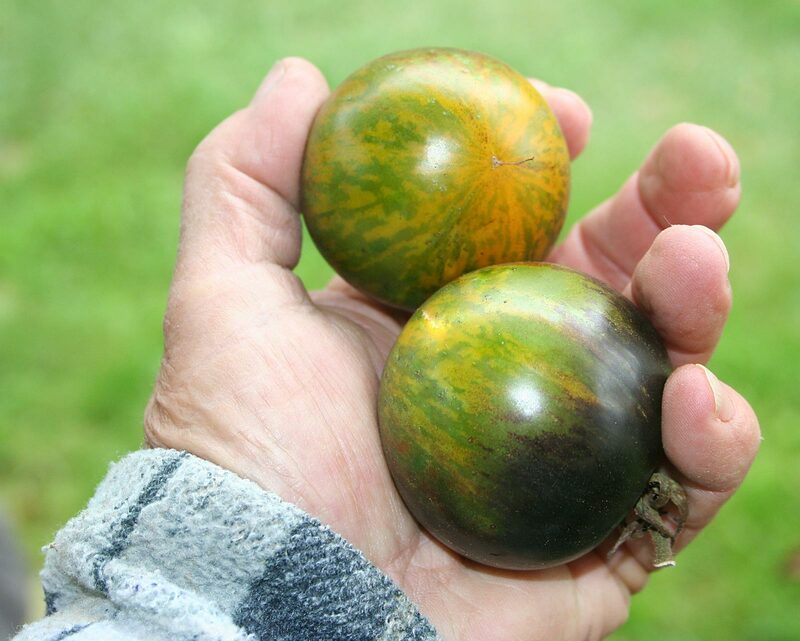 This cute salad tomato is Stripes of Yore and has green flesh with a sweet/tart flavor. I’ll grow more next year and make David’s favorite green ketchup. Heavy mist and fog in the mornings with slowly dropping temps with a frost soon no doubt. Above ground crops finished with potatoes beets and carrots yet to go. Quick question. Raised five different varieties of green beans and all did well but after canning all we wanted we kept watering and let them go to put up as dried beans. Should we let them stay on the vine till after a frost or can we start removing some of the bigger ones now. Enjoy the blog and learn a bunch from it. Pull all the beans which have dried or are quite leathery when you feel them. Shell them right away as in damp weather, especially when not quite mature (hard), they are very prone to mold. Be sure they are dry, dry before you store them. You can leave the not-so-mature ones on the vine through frost and they often will continue maturing after the frost. Jackie, We are getting this rain everyday too. I have not dug my potatoes yet? How long can they sit in the ground in dampness? Or should I dig them and let them dry in the garage? What is the best thing to do? Have you dug yours yet? The commercial potato growers are stuck too. No digging. This rain could last for at least another week yet! Luckily, our potatoes are on sandy ground so I have been digging them on more clear days, then laying them on the lawn, in the sun or fresh air to dry. Before nightfall, I gather them up and bring them inside. By then they’re pretty dry and can go into the potato bins in the basement. Laying them out in a single layer in the garage is a good option as I don’t see any sunny days in the forecast. We have had freezing the last two nights so are still picking like mad. One hoop house is done, the one with our sweet peppers and the other is being heated with propane as we have some very rare hot peppers in there we’d like to finish out. I’m glad your harvest has gone so well! Will has all but two loads of hay in and rowed up for winter. It’s too wet to get those bales yet. It may have to freeze first…. Wish we had some of your rain. It’s been too dry out here in the Pacific Northwest! I’d sure send you some rain if I could! Will, say it isn’t so about Washington State! I live in the NE corner of Washington,(where there are still Grizzly Bears), and it has been too dry. We have up to a 20 percent chance of a tenth-of-an-inch of rain on Sunday. I hope so, as we sure do need the rain! Your pumpkins look great. We chopped up some pumpkins for the deer. They love it … but not the seeds! They ate around high concentrations of seeds. The rascals! I wish you could have some of our rain, Michelle! We’ve got way too much. So your deer don’t like the seeds of your pumpkins??? Around here, they eat a hole in the pumpkin and eat the seeds FIRST, then get to eating the shell. I live in western WA and tried the Ruth Collier paste tomatoes from you. They are great! My favorite paste tomato so far. I grow my tomatoes in containers and got great sized tomatoes. I’m still getting some but tomato season is winding down. We are having a lovely fall here, around 70 degrees and not much rain. But this is WA so it will be coming and the picture of Will reminds me of what it is like. I look forward to your new seed catalog when it’s out. Happy canning and seeding. We love Ruth’s paste tomatoes too! Such good flavor and so many big, fat, smooth tomatoes to make sauce from. Thanks; I’m still madly at canning and seeding so we’ll have plenty of new varieties in our new catalog for you to choose from. We are in North-east ALABAMA. So we will start getting out of the 70-90 days soon i hope. But we are glad not to have 40s and 30s yet. What I wouldn’t give to see 70 again this year!!! lol Our highs are in the mid forties. I do enjoy your blog!! ?? I want to know if you use Tattler lids? It seems you are a likely source as u do soo very much canning. I’m glad you like the blog. Thank you! Yes, I do use Tattler lids and they are SO good. Your updates are inspiring! Thank you for taking time to write. Thank you Heather. And thank you for stopping by!